We’re back from Japan. Hello! I am slowly readjusting to the right timezone, and equally slowly picking out my favourites from the tens of thousands of photos we took. Tokyo is very photogenic. Or maybe I just like having time for photography. Probably both. There are some specific details of our trip I want to come back to (books! food! ), but I thought I would start with my highlights. I don’t think I can rank these in any order, but here are my top five non-food-related Japan experiences. This was on our to-do list right from the start and I am so glad we stuck with it despite some complications with ticket booking. If you have ever enjoyed a Studio Ghibli film, but especially if you are a fan as we are, I highly recommend this bonkers but brilliant museum. No photography is allowed inside the building, but I think even the outside gives you an idea of the creative, whimsical energy of the place. It’s within the grounds of a large park in Mitaka (one of several smaller cities that has been swallowed up into the Tokyo metropolitan area) and there is something beautiful about seeing the Gaudi-esque building appear among the trees. 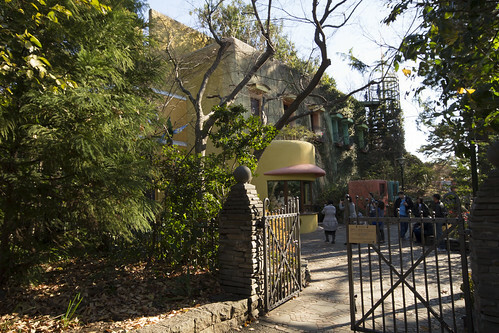 Inside, there is a history of animation; recreations of the Ghibli artists’ workspaces crammed full of original artwork and props; a cinema showing a short film exclusive to the museum; a special exhibition space that when we visited was all about food and eating in Ghibli films; plus the usual cafe and shop. But on top of that, the whole space is beautiful, with nooks and crannies that make it a pleasure to explore. In fact, architecture in general was a highlight for me. Tokyo is packed with creative uses of space and materials in its buildings. In some neighbourhoods I guess this is simply necessity – it is a very full city and space is at such a premium that it pays to use some imagination. But they could have just gone for bland tall boxes. We found skyscrapers, smaller residential buildings and religious buildings side-by-side in combinations that should have been jarring, but are just how the city is. More specifically, I loved the building that housed the art gallery 21_21 Design Sight. 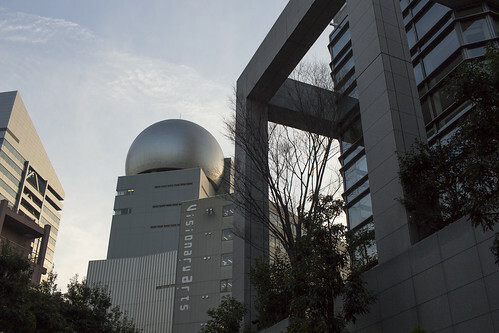 It was designed by Tadao Ando, inspired by Issey Miyake (who is one of the museum’s directors). From the outside it doesn’t look like my usual cup of tea, but once inside I was blown away. Tim had bought a map of Brutalist architecture in Tokyo and we managed to tick off most of the buildings on it, including 21_21 Design Sight and the National Museum of Western Art, which was designed by Le Corbusier. We took a day trip to Yokohama, Japan’s second biggest city, which is a short train ride away. Again I was looking forward to this, but it turned out that the things I had been expecting from it were not the things I loved about it. Yokohama was one of the first ports opened up after Japan’s period of isolation, so the guide books promised international flavour and a large, lively Chinatown. I guess strictly those things are true, but they aren’t exactly unique. What can you do in Yokohama that you can’t in most other places? Step one: go to the Cupnoodles Museum. Yes, that’s a museum dedicated to Nissin Cup Noodles. It’s effectively just one big marketing tool, but it’s cheap and really fun. Children seemed to especially love it. 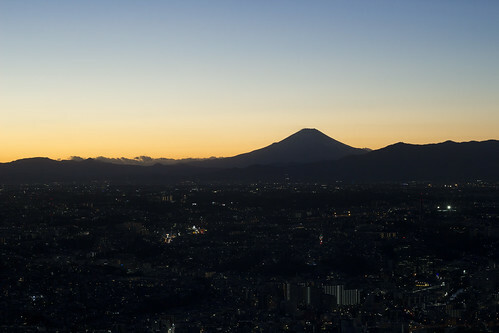 On a clear day, go to the Sky Garden on the 69th floor of the Landmark Tower and watch the sun set behind Mount Fuji. It is incredible. And you get to ride in the fastest elevator in Japan. (They have a certificate and everything.) Then to really cap off your evening, go to the Cosmo World amusement park just over the road from the Landmark Tower and take a ride in the dark on the Vanish rollercoaster. It’s many years since I last went on a rollercoaster, but back in the day I was quite the aficionado and I definitely rate Vanish. For most people, if you have a picture in your head of Tokyo before you arrive, it’s Shinjuku you’re picturing. 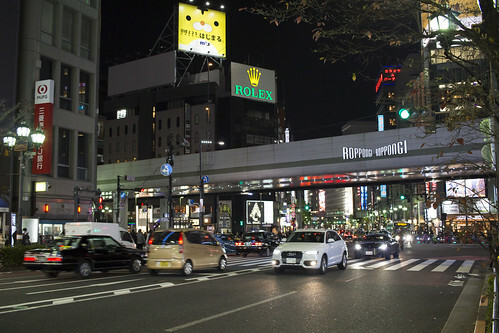 I particularly wanted to visit Kabukichō, the corner of Shinjuku that inspired the set design of the original Blade Runner and indeed, that first appearance of Kabukichō took our breath away. We literally said “Wow!” at the sight. 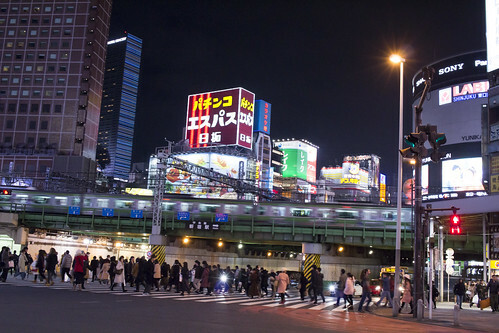 A lot of Tokyo is tall buildings and bright lights, but in Kabukichō it’s turned up to 11. And yet right alongside those streets are narrow alleyways full of food stalls and paper lanterns. I loved it. Speaking of sights that made us say “Wow!” I loved Nikko so much. Tokyo can get a little overwhelming, it’s so bright and busy, plus basically everything closes on 1–3 January, so on New Year’s Day we hopped on a bullet train to a small mountain town 80 miles to the north. It’s a major tourist destination, so it wasn’t exactly empty, but suddenly there was space and fresh mountain air and snow. And oh my, the temples. 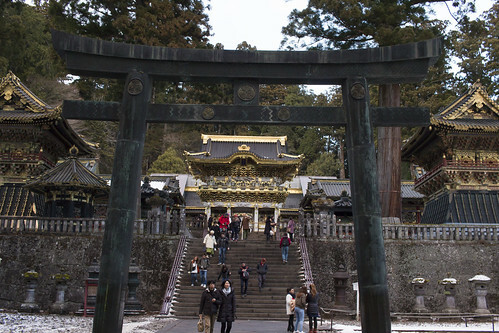 Nikko is home to a UNESCO World Heritage protected complex of shrines and temples from the 17th century, and these “national treasures” are genuinely astounding. But the whole mountain is dotted with shrines and temples that you stumble upon wherever you climb, and you can quickly lose the crowds once you leave the main complex. It was truly incredible to stand at the top of a flight of stone steps with a waterfall on one side of us, a series of beautiful religious buildings ahead of us, a blanket of snow all around and not a single other person in sight. The shrines and temples close at sunset, and the whole town is pretty much closed by 8 pm, which meant we got a super early night, and we decided to take advantage of that by getting up early the next day for sunrise. I know you can watch sunrise anywhere with a decent view to the east and a reasonably clear sky, but it was truly magical from the park near our hotel, with the surrounding mountains gradually changing colour. I hope I never forget it. If you’re interested in seeing more of my photos from Japan, I am gradually adding them to Flickr.